Peak season for European travel runs from June to August, but that doesn’t mean you can’t roam around the continent the rest of the year. Cities like Vienna and Berlin garner much-deserved attention during the winter holidays, largely thanks to their famous Christmas markets, but locales all across the landmass are made even more charming by blankets of snow between November and February. This year, trade in a refreshing Aperol spritz for a warming espresso in Italy or skip sunbathing on the Croatian coast in favor of a cozy getaway in Zagreb. Whether you’re a skier, sightseer, or foodie, you’ll find something you like in these seven European cities this winter. 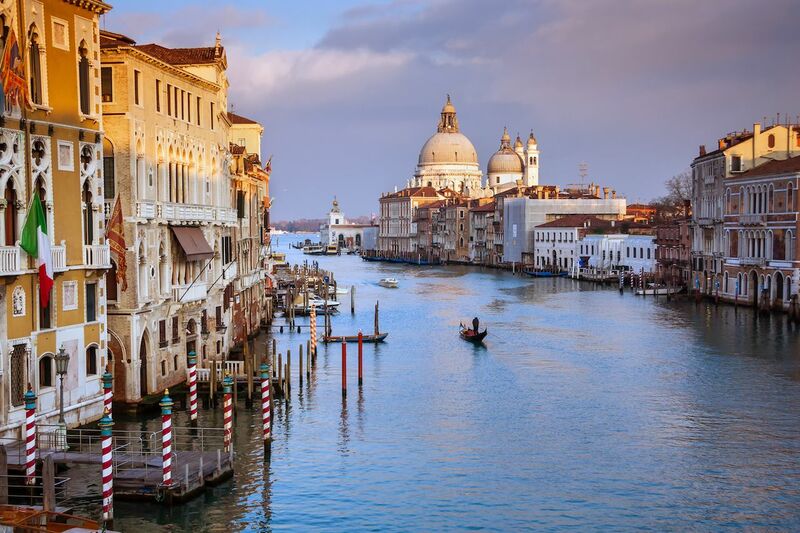 For most, Venice conjures up images of romantic gondola rides down canals and children chasing pigeons in Piazza San Marco under cloudless skies. But something special happens in the off season: Venetians take back their city. Gondoliers float on, shrouded in silver mist; famed historic sights remain standing as they have for centuries, now free from the crush of summer tourists; and most days, clear skies still stretch overhead. Walk along the water, down cobblestone alleys, and across bridges like the iconic Ponte di Rialto in the brisk winter air. Later, duck into the Basilica di San Marco to get in from the cold or take in a show at the La Fenice opera house. Best of all, leaning into the Italian coffee culture means never going without a warm drink in hand. Stops like Caffé Florian, operational since 1720 and touted as the oldest coffeehouse in the world, are attractions in their own right. Framed by the Southern Carpathian Mountains, medieval Braşov is a gateway to Transylvania, whose mystical atmosphere intensifies in the season’s long dark hours. 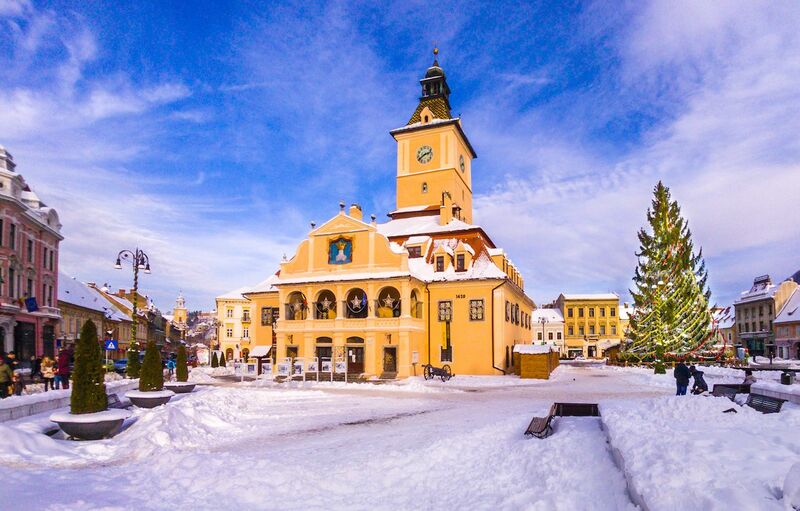 In winter, Gothic belfries rise up over snow-dusted rooftops, and the bohemian cafes lining central square Piaţa Sfatului welcome visitors with hot coffee and treats like chocolate krantz cake. Bundle up for a free walking tour or the city, taking in architectural wonders like Biserica Neagră, or Black Church, and Braşov Citadel. Alternately, venture outside the city for a sleigh ride through the snowy surrounding forests or hit the slopes at Poiana Brașov, the largest ski resort in Romania. Before leaving town, be sure to take a cable car up Tampa Mountain to the lookout point at the Hollywood-esque Brașov sign for unparalleled views of the wintry city. Croatia draws huge crowds of sun-seekers to its pebbled beaches during summer, but inland capital Zagreb is ripe for a winter retreat away from the Dalmatian Coast. The yuletide spirit hits the city hard come Christmas when Advent festivities are in full swing. The holiday season is a flurry of Christmas markets smelling of cinnamon, nativity scenes staged between trees done up in twinkling lights, open-air concerts in Ban Jelačić Square, and even ice-skating rinks. Skiers can steal away to nearby Medvednica and highest peak Sljeme for a weekend escape or day trip. Outdoorsy types looking for scenery but not slopes are also not far from Plitvice Lakes National Park, whose waterfalls take on a dreamy quality when frozen. Back in town, end any day with a glass of mulled wine and fritule, donut holes filled with liquor and dried fruit. 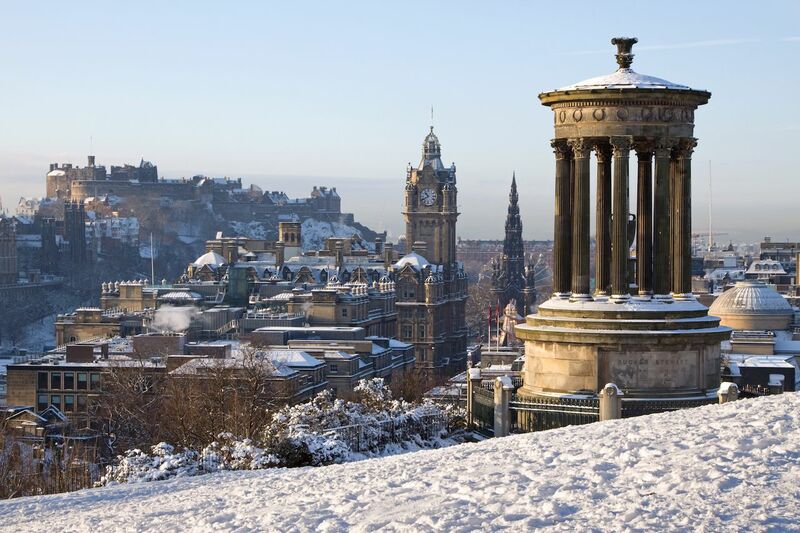 Edinburgh never looks quite as lovely as it does frosted in snow. Admire historic sights like Edinburgh Castle and Holyrood Palace blanketed in fresh powder, then hit Princes Street for some holiday souvenirs shopping and wind down by pub-hopping around Old Town. But above all else, plan to visit around New Year’s Day for the unforgettable days-long affair known as Hogmanay. Celebrants usher in the next 12 months with torchlight processions, silent discos, and other events held on the streets while others dance the nights away in venues across the city. Elsewhere, bonfires burn, traditional Scottish music sounds, and costumed merrymakers wade in the frigid Firth of Forth estuary in a tradition known as the Loony Dook. Dive in if you dare. 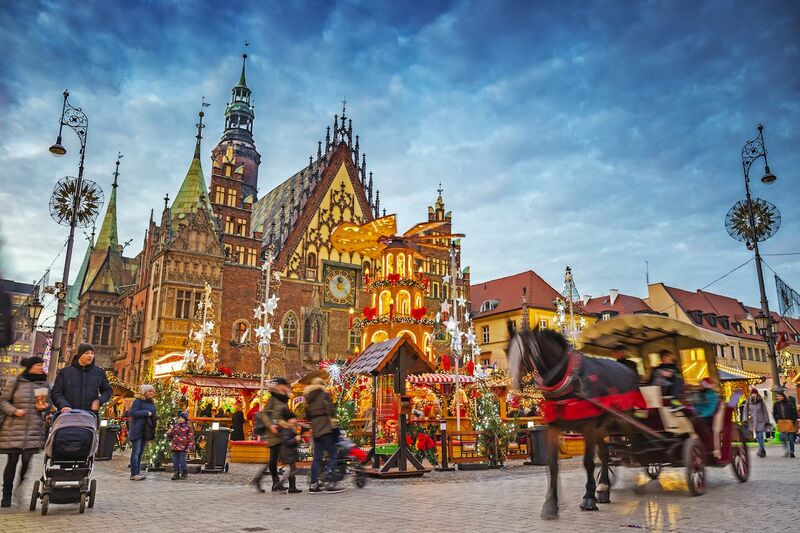 Despite being the fourth largest city in Poland and the 2016 European Capital of Culture, Wroclaw has remained delightfully under the radar, particularly among winter travelers. Perhaps its biggest draw is that the city has a large student population and youthful energy, largely revolving around the cafes in Market Square where you can treat yourself to a paczki, or Polish donut. There are several free themed walking tours of Wroclaw, including food tours that will introduce you to the rest of the local delicacies and tours dedicated to uncovering the many bronze dwarf statues that are hidden throughout the city. If you need to escape the chilly weather (it is winter, after all) you can also pop by the Wroclaw Opera for a bit of ballet. Forget Christmas in Vienna. Head to Tallinn this year, instead. 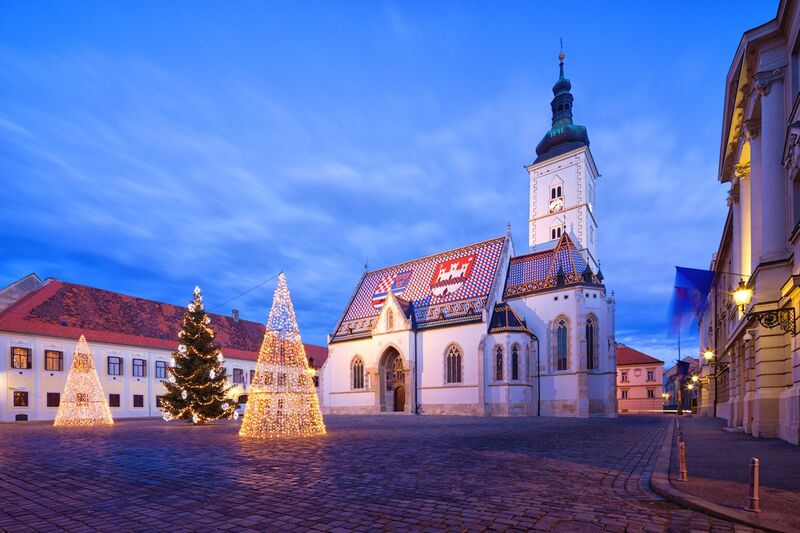 The medieval Town Hall Square plays host to one of the best Christmas markets on the continent. There, you’ll find a resident Santa Claus and merry-go-round for the little ones; song and dance performances; one of the oldest public Christmas tree displays in the world; and goodies like gingerbread cookies and mulled wine, known locally as hõõgveini. Beyond immersing in holiday cheer, visitors can fill the wintry days with dog-sledding excursions just outside the city and trips to the Marzipan Museum Room in town, which chronicles the history of the sweet from the Middle Ages and displays everything from cakes to edible figurines. 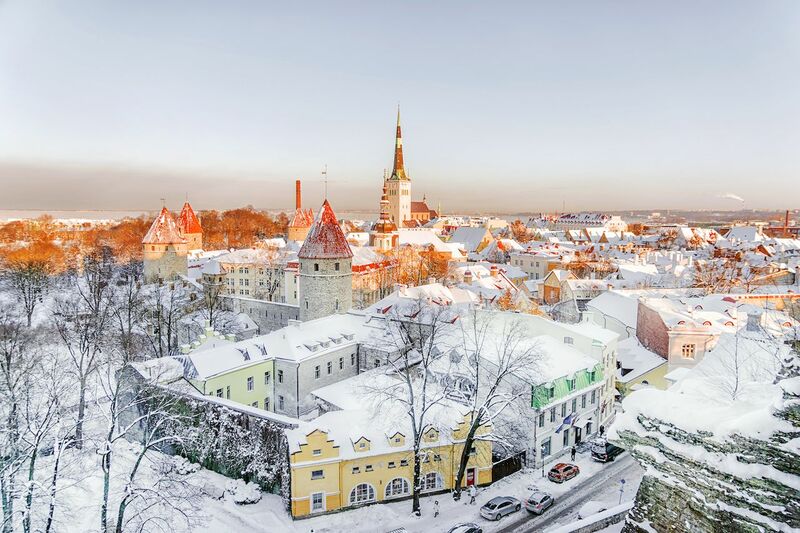 See the red-roofed city painted white by fresh coats of snow from the top of Toompea, or Cathedral Hill, then get toasty in one of the public saunas found around Tallinn. Between its castle perched in the mountains above Lake Bled and magical floating island church, visiting Bled is like stepping into a Disney movie. Significantly fewer people come during winter than summer, leaving the idyllic town to be toured in peace by those in the know. 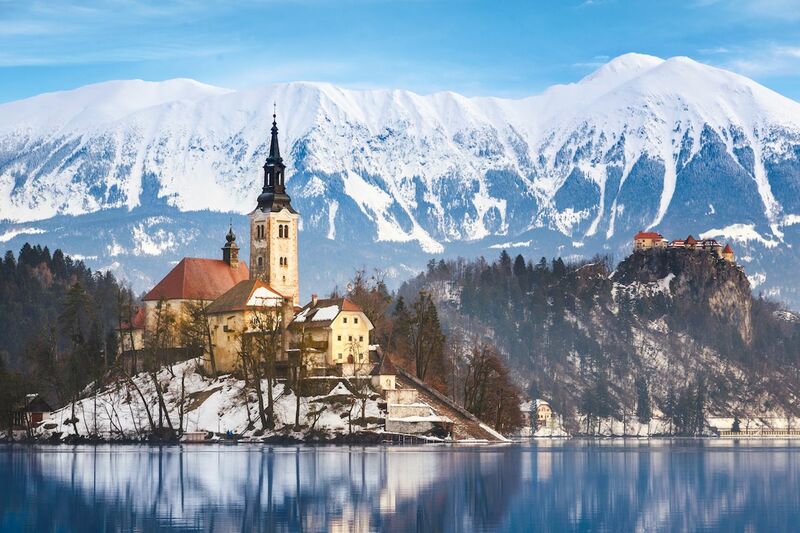 Get the best views of the city from Bled Castle, believed to be the oldest in Slovenia, which also houses a museum and wine cellar where guests can settle in for tastings. Later, stroll through town in search of the perfect cream cake, a pastry so beloved it’s a symbol of Bled. There are also several ski resorts in the Julian Alps just outside the city where skiers and snowboarders can get a downhill fix. Best of all, most of the hotels in the area come equipped with saunas and hot tubs, promising a cozy end to every enchanting day.